LITTLETON —Considering how Historic Downtown Littleton is dotted with galleries and art-friendly businesses — not to mention being home to an art school — it may come as a surprise that the area hadn’t been hosting First Friday art walk events already. But now the area and the new Downtown Littleton Art District are on the First Friday bandwagon, and business owners, local officials and art students alike are hoping the monthly events, so popular in places like Denver’s Art District on Santa Fe, will help shine a light on the city’s artistic side. “Littleton does such fun and unique things down here, and it just seemed like we needed an art walk to add to the festivities,” said Sudee Floyd, owner of Outnumbered Gallery. Floyd opened Outnumbered just north of Main Street on South Prince Street in August and has helped pump momentum into the downtown art district. She said she had been hosting informal First Friday gatherings at her gallery since the fall. A city resident most of her life, Floyd said the last recession was tough on Littleton galleries, but the art scene is bouncing back with the economy. With support from the city, which facilitated art district discussions and flew a banner over Main Street announcing the art walk, she sees the events becoming major draws. “I think people are ready,” Floyd said before the First Friday got underway May 1. Floyd invited sculptor Tim DeShong to hold a demo in front of her gallery, giving passersby a chance to experiment with shaping stone. The nearby Town Hall Arts Center had four visiting artists in attendance to talk with visitors. Mayor Phil Cernanec, who calls Historic Downtown Littleton the city’s “stage,” said the art walk is an opportunity to draw attention to the area’s vibrant culture, as well as encourage visits to all area businesses. “Our hope is that, even though this event is from 6 to 9 p.m., folks might come down and enjoy a meal in Downtown Littleton beforehand and then take in some of that art scene that’s there,” he said. A major partner in the art district is the art program at Arapahoe Community College. 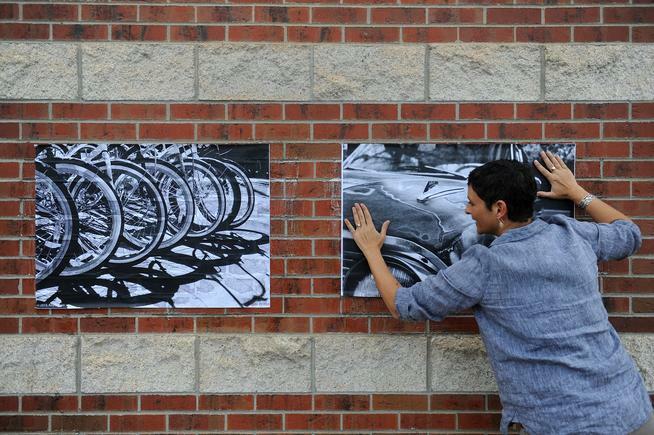 Led by faculty members and artists Nathan Abels and Angela Faris Belt, about a dozen ACC students pasted large photo prints on walls and recreated classic paintings in chalk on the covered walkways of the school’s Art & Design Center at the corner of Prince Street and Alamo Avenue. ACC graphic design students created the logo for the art district. Ables said First Friday is a great opportunity for the ACC art program to build a sense of community, while also working with its neighbors. Belt added the events are an excellent opportunity for students to see their art featured in public. Other businesses are involved, as well, staying open later and offering special promotions. Tandi Venter, co-owner of Spur Coffee, kept her shop on Prince Street open well beyond its usual 5 p.m. close time and brought in singer/songwriter Josh Dillard to play an evening set in the cafe. Venter said it was the first time Spur hosted live music.